Yesterday, Prime Minister Kan Naoto apologized, twice, to a joint assembly of Diet members of the Democratic Party of Japan. He expressed his profound regret for having talked about raising the consumption tax when his party had only just clambered out of the abyss in popularity it had fallen into under the leadership of former Prime Minister Hatoyama Yukio and Party Secretary General Ozawa Ichiro -- an ace which set the party's popularity plummeting again just in time for the House of Councillors election. That the party's popularity even had an ability to take a dive from any height was due to Kan's having been elected the party's leader, lifting the party from out of the lethal miasma that his predecessor and Ozawa had sunk it, has been opportunistically forgotten in some quarters. The PM was not the only one to apologize for speaking about matters of important without thinking of the consequences. Party Secretary General Edano Yukio also apologized for talking about the rise of the consumption tax and about the rival Your Party (Minna no To). The floor of the assembly was then opened up to any and all who have a problem with the way the current leadership group wants to deal the party's having lost 10 seats on July 11: say they are sorry for having uttered inconvenient truths about Japan's fiscal policy and the party's political position, bow deeply and then get on with the business of governing without coalition control of the House of Councillors. There was no dearth of those willing to take potshots at the core leadership, given the presence of a battalion of TV cameras and an open microphone. Member of the House of Representatives for Hokkaido District #12 Matsuki Kenko (whose homepage seems to follow the Billy Idol rule of "Too Much is Never Enough") insisted that "What is important, if anything, is that somebody takes responsibility with firmness. The executive council is the body responsible for taking responsibility." One should note that Matsuki is on record as saying, admiringly, if absurdly, "The only one who has not wavered since the results of the last election is Ozawa Ichiro." Kawakami Yoshihiro, member of the House of Councillors for Tottori Prefecture (and yes, the yellow banner ad under Kawakami's face on his home page shouts out exactly where his allegiance lies) claimed that, "Is it not true that the supreme high command is that which creates a defeat in a war? How will responsibility be taken? It is obvious that responsibility must be taken. This Cabinet will be considered a dead body (shinitai) otherwise." The key phrase in all the complaints was "taking responsibility" (sekinin o toru). While sekinin o toru is one of the favorite set phrases of the political classes and the commentariat, there has never ever been a cross-party consensus on what the phrase means. "Taking responsibility" could be admitting something came about as the result of one's own mistake and vowing to make amends for what one has done. It could be forcing everyone to look at a heretofore hidden or ignored problem and saying, "I-We have to fix this problem." In most political contexts, however, "taking responsibility" means someone says "Sorry" for whatever bad thing that may have happened, whether he or she had anything to do with what happened, then ostentatiously resigning, without there be any clear indication how in the future the unfortunate occurrence will be prevented from happening again -- a definition of "taking responsibility" that seems to be closest to running away from taking responsibility. "Taking responsibility" is, in fact, a relinquishing of responsibility, a cop out, a way of disappearing into undisturbed retirement without anyone, anywhere, feeling truly sorry or responsible about anything. Unfortunately for all those opining yesterday at the party's joint assembly of lawmakers, an assembly that Ozawa Ichiro, as is his wont, did not attend -- is that no one had the gumption, the smarts or the quirky self-confidence to point out that the act of "taking responsibility" had already taken place, in June, when Ozawa and former Prime Minister Hatoyama Yukio resigned, taking responsibility for leading the DPJ on a wild and harrowing ride from a position of overwhelming strength and power in September 2009 to feeble begging for votes in all the wrong places. That none of the current crop of leaders feels the least need to take responsibility in the classical sense, even in the face of harangues from Ozawa surrogates, is a tribute both to their own self-confidence and their own sense of what responsibility really is--which is taking the bull by the tail and facing the situation, to use the vernacular. The next hurdle for the current leadership is not today's opening of an extraordinary session of the Diet -- where the strutting Liberal Democratic Party and the smirking Your Party will set out to score political points based upon the results of the House of Councillors elections -- but the DPJ leadership election, the first normal election for a DPJ party leader in eight years. Due to the populist election system, a determined and unscrupulous candidate has a chance to do an end run around the main body of legislators in the Diet, this through the mobilization of long-cultivated local support groups and by promising the impossible to the members of local municipal and prefectural assemblies -- which is exactly what Ozawa Ichiro has been doing for, oh, let us say the last three or four years. Anyone with any skills in organizing write-in campaigns might want to apply for a position with Kan & Co. right now. There are 300 floating party member and party supporter points in the DPJ's September leaderhisp election, a goodly chunk of the 1224 total points up for grabs. These party member and supporter points are ready to fall into the hands of the person who can convince enough folks to join the DPJ on short notice and send in a postcard to their House of Representative district chapter, or seduce existing party members and supporters into writing a particular candidate's name on that postcard. That is where the action moves to now -- despite all the panting reporting last night on all the various DPJ parliamentary groups having dinner together in this, that or the other restaurant. Shaping how the local party members and local assemblypersons understand "taking responsibility" -- this will become the crucial battleground. Later - Many thanks to reader MP for catching the typos in the first version of this post. "You know the loss of seats in the House of Councillors' election? It was not your fault. The presence of Minna no To candidates in the districts cost the Democratic Party between five and eight seats. Cooperation between the New Komeito and Liberal Democratic Party -- cooperation that was almost certainly the result of threats that Ozawa Ichiro has been making for years against the numbers of proportional seats in the Diet -- cost the DPJ probably at least another four seats. The reason why Minna no To represented an attractive non-DPJ, anti-LDP alternative in the proportional vote? The accounting crimes of former Prime Minister Hatoyama Yukio's aides and the media pogrom against a single Ozawa real estate deal. That and Hatoyama's inability to take a stand upon anything during his brief tenure. You need to stop blaming yourself for what happened. You always go overboard in taking responsibility for matters that an objective third party would declare to have been outside your control. As regards the consumption tax you said something tactically stupid but strategically wise. Laugh off the loss and start cracking the whip. Oh, and another thing - the Finance Ministry bureaucrats you and Chief Cabinet Secretary Sengoku Yoshito have been relying upon as Japan's ultimate realists? Think of them as Japan's Taliban. Sure it is an unfair and outrageous depiction, but you need an extra strong aversion to their seeming mastery of the numbers. Otherwise you will not lead, you will be led. Minus a visceral negative mindset you will fail to resist their depressed and depressing certitude." For those who were fans of the Katz-Fink dialogue, Shane Baldwin offers over at Forbes.com a digest of the reasons why paranoia about Japan's sovereign debt is unnecessary, if not indeed shameful. Over at The Economist, Banyan (in one what seems to be one of his last columns under his assumed identity) consults the research of Dr. Alexis Dudden in order to answer the question: "Why do we have a mid-summer national holiday celebrating The Sea?" As one would expect, it is not all salt, sun and fun...nor much respect for the mother of us all. Tsujimoto Kiyomi has never been one to avoid the spotlight. Bursting into the national consciousness with her infuriated attempt to pin down former Prime Minister Koizumi Jun'ichiro into answering a question -- her shouted "Sori! Sori! Sori!" becoming something of a national catchphrase -- she later astounded all by getting caught with a ghost employee on her tiny staff -- a crime for which she was arrested, convicted and given a suspended sentence. Then, despite the supposedly lifelong scarring a conviction of a crime usually inflicts upon a person, she did the one thing she knew how to do: run for national office, most recently winning the Osaka #10 district seat in 2009 -- becoming one of the few of members of the Socialist Democratic Party to hold a district rather than a proportional seat. Last night, Tsujimoto shook the party and the political realm with talk of leaving SDP. For the party, her departure would be a public relations disaster: aside from party leader Fukushima Mizuho, Tsujimoto is the party's most recognizable politician. She is frequently partnered with the local candidate on party political posters -- possibly even more often than Fukushima herself. The party also went out on a limb readmitting her, a convicted felon, back into the party's ranks. SDP Secretary Shigeno Yasumasa, with whom Tsujimoto had her meeting last night, is adamantly rejecting acceptance of her resignation. However, Tsujimoto is most likely on her way out. Her appointment as Senior Vice Minister of Land, Infrastructure, Transport and Tourism under the Hatoyama Cabinet capped a long fight back to political respectability. Having to surrender her post following the SDP's decision to withdraw from the ruling coalition over Fukushima's opposition to the Futenma-to-Henoko agreement was a bitter pill for Tsujimoto. Normally stoic and sarcastic, she wept profusely and bitterly as she said goodby to her staff at the Ministry. Tsujimoto's remaining in the party after its withdrawal from the coalition seems to have been conditional. If Fukushima's dramatic dismissal from the Cabinet over the Futenma deal led to a spike in electoral support for the SDP nationwide or for its candidates in the districts, then Tsujimoto would swallow her disappointment and stick with the party. However, on July 11 the party performed disastrously: losing one of its three seats from the proportional list and in all of its districts lost -- even in the Okinawa contest against an LDP candidate who had only recently switched from supporting the 2006 Roadmap to opposing it. So where does Tsujimoto go after leaving? 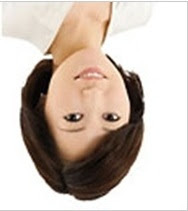 The eventual natural fit for her is the ruling Democratic Party of Japan. 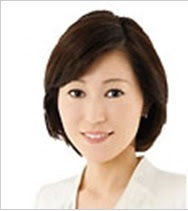 As the first defector to join the DPJ after that party's terrible showing in the July 11 elections and a former loyal member of the Hatoyama government, Tsujimoto would certainly be rewarded with a position within the party well above what her seniority would merit. A question right now is whether anyone within the ruling party will be insisting on receiving the credit for encouraging Tsujimoto to leave the SDP. Based on a photograph I flagged in September 2007, I can imagine one person who might have a reasonable and quite inconvenient (for the current DPJ leadership group) claim to have been working toward this result for quite some time. Tsujimoto's defection and likely cooperation as an independent with the DPJ--utnil such time as she could actually join the party -- points out a little remarked reality of the post-July 11 Japanese political world: with 306 seats in the House of Representatives, the DPJ is closer to the two-thirds majority it would need to override actions of the House of Councillors than it is to a coalition producing a working majority in the House of Councillors. In terms of passing legislation the DPJ likes, luring 13 more legislators into cooperation with the party in the House of Representatives seems a far better bet than trying to deal with the standoffish Watanabe Yoshimi's Your Party or the self-righteous New Komeito in the House of Councillors. * An earlier version of this post had an incorrect acronym in the title line, leading to a host of incorrect versions of the English language name of the Shakai Minshuto. What would it make sense to read? Auslin, Michael - Angsty Allies in The Wall Street Journal. Harris, Tobias - Toward a New Security Consciousness in Japan? at ANU's East Asia Forum. Schuman, Michael - A Clouded Outlook in TIME. I know what you are spluttering, "But, that's TIME, the magazine. The purveyors of some of the most egregious garbage on Japan over the last decade!" The article is nevertheless a reasonably solid presentation of what are some chronic problems, best when you can hear the author just about tearing his hair out as he interviews his most obdurate subjects. Yes, I too wish I had a least one op-ed or article by a woman of the female persuasion to recommend this morning. Women are all over the day-to-day news -- Hiroko Tabuchi, Michiyo Nakamoto, Isabel Reynolds, Sachiko Sakamaki, Anna Kitanaka, Yuri Kageyama, to name but a few -- but are M.I.A. in the commentary department, Sheila Smith being the lonely exception. Hat tip this morning to Japan Without the Sugar, for pointing me in the direction of the TIME article. In an attempt to attach some numbers to the nebulous concept of hikikomori, the unknown numbers of persons in between the ages of 14 and 40 that consider themselves cut off from the rest of the world, incapable of leaving their rooms or their homes and in contact with only with members of their immediate family, the Cabinet Office tried conducting person-to-person interviews with 5000 citizens 15-to-39 years of age to ask them about their life habits. The interviewers were able to conduct full interviews with 3287 respondents, a 65.7% response rate. Of the respondents, 1.79% classified themselves to be full-blown hikikomori, a percentage if compare the national population of the age cohorts in question would indicated a national population of 696,000 hikikomori. 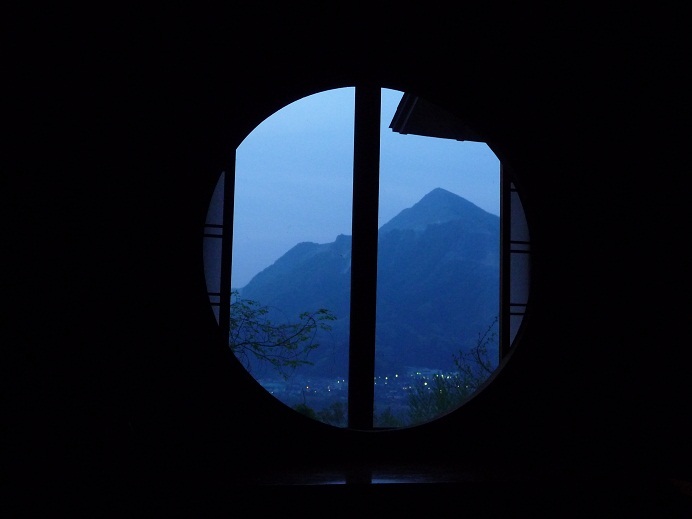 In addition to those who categorized themselves as hikikomori, some 3.99% of respondents, agreed with expressions such as "There are times I too want to lock myself away" -- making them seeming candidates for a transition to hikikomori status. However, when one drills down into the numbers, the actual population of the classic hikikomori, of persons locked inside their rooms, being brought meals and leaving only to visit the bathroom, seems insignificantly small. "I do not leave the house" 0.09"
Adding all these up to a more more narrow definition in line with the popular image of the hikikomori, the government finds a less staggering 236,000 hikikomori, only a tiny fraction of whom are living truly hermetic lives. It is only by adding the above to the 1.19% of the respondents who say, "I go out whenever I need something that helps me pursue my hobbies" that one reaches the 1.79% fraction. As to why the 1.79% respondents fell into their hermetic lifestyles, 23.7% said, "I got sick" or "I just couldn't fit in at work;" 20.3% said, "My work search did not go well;" 11.9% said, "I stopped attending (elementary, junior high, high) school;" and 6.8% said, "I did not fit in at college." In the breakdown in the sexes of those classifying themselves as hikikomori, men outnumbered women 2-to-1 (66.1% to 33.9%). As to the age cohorts, 33.9% of the self-identified hikikomori were in their teens, 38.9% in their twenties and 23.7% in their thirties. Interestingly for those who would seek to reduce the number of hikikomori were the percentages of persons who seemed trapped by embarrassment more than anything else, in need of perhaps nothing more that a little push to get themselves going again. Over 7 out of 10 hikikomori (71.2%) felt sorry for about what they were doing to their families. 50.8 % felt afraid of what others might think of them. I may be overly optimistic, but it sound like that with a little counseling, perhaps some medication over the short term and a supportive local environment -- together with a temporary expansion of a worker training and job search programs -- the hikikomori social phenomenon can be reduced to a tiny number of truly mentally ill individuals. Then again, believers in the hikikomori crisis would argue for a vast undercount, saying, "Why would on Earth would hikikomori answer the questions of government survey takers?" Sources: Jiji Press and Kyodo reports of the findings. Actual Cabinet Office report is not yet available online. It seemed inevitable...and yet the day never came. It seemed it would never come. It was going to happen one day, over some incident or demand -- the day when the populace of Japan decided it heard enough of the sob stories of the families of the abductees -- the persons kidnapped by North Korean agents in the 1970s as a part of a seemingly ad hoc program of providing North Korean agents with unwilling instructors of Japanese language and customs. While five of these kidnapped persons eventually returned to Japan, the majority, according to the DPRK government, did not survive their captivity. The demands for the parents and siblings of these unreturned kidnappees have held successive Japanese governments hostage to pursue a hopeless and unrealistic total struggle against the government of the DPRK until the abductee problem is resolved to the families' satisfaction. Long the darlings of the right wing in Japanese politics, for whom the vivid demonization of the DPRK was a convenient cover for a weakening of post-1945 Japanese pacifism, the families and the government seem to have crossed the Rubicon this week. They invited to Japan Kim Hyon Hui, the convicted DPRK assassin, who, posing as a Japanese traveler, planted a bomb on KAL jetliner in 1988, killing all 115 persons aboard the aircraft. To make matters worse, the families met with Kim at the country home of former prime minister Hatoyama Yukio in the exclusive and expensive resort town of Karuizawa. Kim certainly had direct ties with one of the abductees, Taguchi Taeko, who was her teacher of Japanese in Pyongyang. Indeed it was Kim's confession that she had learned her Japanese from a woman abducted from Japan that punched the first hole in the Japanese government's assertions that the abductee problem did not exist, that the missing persons were not kidnapped, just missing. As a member of the special espionage branch Kim certainly knew of the other abducted Japanese. However, since she has been interviewed almost incessantly since her arrest, she certainly had nothing new to tell the families of those who did not return. There was certainly no reason to bring her to Japan, considering her terrorist past. In bringing the pardoned Kim to Japan and entertaining her in such lavish style when she has nothing of substance of offer the government of Japan or the families of the abductees, except yet another opportunity for someone to repeat a maudlin retelling of the Yokota Megumi story, the government and the abductee families seem to have blown the collective fuses of economics-problems-focused public. Need it be said that the opposition Liberal Democratic Party of Japan, which itself had once been in the thrall of the abductee issue, is having a field day criticizing the current government for its solicitude toward Kim? In the records of public relations and media management failures, this visit looks like one for the textbooks -- on how even a completely controlled, can't miss event can dissolve into a media circus and a public embarrassment. 1) Why can't the DPJ do PR? 2) Will this overstaged visit be the abductee families' last hurrah? The Democratic Party of Japan is scheduled to hold a regular party leadership election in September. Prime Minister Kan Naoto is the prohibitive favorite to win this election despite the drubbing the party suffered in the recent House of Councillors contest. However, the rules for electing a party leader are rather Byzantine, leaving plenty of room for the running of an insurgent campaign, one that could give Kan and the rest of the current core party leadership serious angina. The eligible electorate is divided into three sectors: a) registered party members and party supporters b) local officials who are DPJ members and c) Diet members. Registered party members and party supporters mail in their votes to their local DPJ House of Representatives district headquarters. The candidate with the most mail-in votes from a House of Representatives district wins that district's one point. If a party headquarters fails to receive 100 total votes from supporters or party members, that district's point is forfeited. The 300 potential points correspond to the 300 House of Representatives districts. Local officials Members of prefectural and municipal assemblies who are members of the DPJ all have the right to mail in postcards to DPJ headquarters with one candidate's name on it. After the votes for each candidate are tallied, these 100 local officials assembly members' points are apportioned to the candidates according to the D'Hondt system. The DPJ members of the Diet from both Houses attend a joint party leader election assembly. At the assembly each member writes the name of just one of the candidates on a secret, written ballot. When the ballots are opened, each vote for a candidate is recorded as two points for that candidate. There are currently 306 DPJ House of Representatives members and 106 DPJ House of Councillors members, meaning that a potential 824 points will be awarded through the direct election at the assembly. The candidate with the most total points from this process wins. That is what the rules say, until someone convinces me otherwise. Source: DPJ website, "Daihyo senkyo kisoku"
Yes, that the URL for the rules regarding the DPJ's leadership election is written out almost entirely in English strikes me as weird and embarrassing too. Is There An August Surprise Regarding the Futenma-to-Henoko Deal? On July 2, Sato Masaru, the extremely controversial former research analyst at the Ministry of Foreign Affairs, published a brief and rather annoyed opinion article in The Tokyo Shimbun. Sato, who is of Okinawan extraction, was complaining about the agreement that Foreign Minister Katsuya Okada and Defense Minister Kitazawa Yoshimi signed in Washington on May 28 reaffirming the promise to move the U.S. Marines elements currently based at MCAS Futenma to a so-called Futenma Replacement Facility (FRF) to be built offshore of Camp Schwab in Henoko, Okinawa. What annoyed Sato was not the agreement. It was the translation. Or lack of one, to be precise. Sato begins his article with a recollection of his time in the Japanese Embassy in Moscow. Whenever bilateral agreements were being worked on, they were worked on in both Japanese and Russian simultaneously by the experts working for both sides. Every line, every word in each the text of an agreement in one language was checked aggressively against its counterpart in the other language, that nothing of possible detriment to Japan's interests sneak in due to a misused or ambiguous Russian term or construction. Both the Japanese and the Russian sides negotiated over every ambiguity, to nail down what every word of the bilateral agreement meant. In the end, the product would be two texts, one in each language, of equal validity, with Japan able to walk away with the confidence that in the case of any controversy, the Japanese side could point to the Japanese text as the definitive text. To this, Sato contrasts the May 28 joint statement on the Japan Security Consultative Committee, where the government of Hatoyama Yukio acceded to the United States insistence that a Futenma replacement facility be built at Camp Schwab. Sato notes that contrary to the practices followed during his time in Moscow, the Japanese version of the text is not official. It is merely a "provisional translation" (kariyaku) of the English official text. For Sato the lack of an equally valid official Japanese translation is a travesty -- a dereliction of duty by Japan's diplomatic corps. The question is, when the Hatoyama Cabinet ratified via a Cabinet Decision (kakugi kettei) the May 28 agreement, what did it actually do? A basic principle of Japanese law holds that only texts written in Japanese have legal standing. If only a provisional translation of the Consultative Committee's was presented for ratification at the emergency Cabinet meeting held on May 28, after the forced resignation of Fukushima Mizuho, it does not follow that the agreement has legal standing inside Japan. In theory, in the absence of an official translation (seibun) the Cabinet ratified an unefforceable document. At least, I think you can find a judge somewhere who would be willing consider the validity of this line of argument, and would be willing to issue a stay of any implementation of the May 28 agreement until an official translation has been produced and approved by the Cabinet. Was the failure to submit an official translation to the Cabinet on May 28 really the result of sloppy work by diplomats? Or was this presumed spinelessness/laziness by design, an attempt to buy off the American side with a Potemkin ratification of what might indeed be a worthless piece of paper, taking the issue off the front pages until after the House of Councillors election? To what extent can a Cabinet Decision can override a basic principle of law? This is the graph of the proportional party seat personal (kojin) vote totals for the New Komeito and its list of candidates in the last House of Councillors election. In the proportional vote, you can either vote purely for the party or for a single member on the party's list. Each vote for a single member counts as vote for the party, while the single member's vote total determines the ranking of that individual in the party's list when it comes time to divvy up the seats according to results spat out by the D'Hondt formula. Having supporters of a party vote for individuals within the party rather than the party generates two potential dangers for the parties. Voters trying to write down personal names rather than party names are more likely to submit spoiled or invalid ballots. While every party has its celebrity "name only" candidates (like the Democratic Party of Japan's judoka mom Tani Ryoko) the parties tend to avoid encouraging their supporters from voting for the person, rather than the party. The New Komeito's number really sticks out. It is even more of an outlier when one understands that the Sunrise Party's low number is the result of the second serious danger, a crafty operator like Katayama Toranosuke's use of his former support groups (koenkai) to vault up to the top of a party's list and to seize what is ostensibly a party seat essentially for himself. So why does the New Komeito voter more likely to make the unusual decision to take the riskier course 52% of the time, writing down a personal name rather than a party name, and choose from a list of 17 persons in a manner that in the aggregate produces the extraordinarily shaped distribution we see above, which I call the New Komeito Ski Jump? Two words: coordination and obedience. Voters must receive instructions as to whom they are going to vote for--and the persons giving out those instructions have to be certain that those instructions will be carried out to the letter (or kanji or the kana, as is most likely the case here). Furthermore, in order to get that astonishing cutoff, the voters have to know who the anointed members of the party list are and who can/should/must be ignored. Which brings up the real question: where did the New Komeito's 5.3 million district election votes go? In 2010, the New Komeito fielded just 3 candidates in three electoral districts, one each in Saitama, Tokyo and Osaka. The total vote going to these three candidates was 2,265,818 votes. Looking at the lists below, some 5.3 million voters in 44 prefectures who plunked down for either the party or one of its anointed candidates in the proportional party vote had to vote for someone other than a party candidate in the district election. As to a guess as to who that someone else might be, let us take a look first at the proportional party list results of the July 11 elections. Call me unsophisticated and naive ("You are unsophisticated and naive" - Ed.) but when I look one line up in each column and see a 5.4 million vote rise in between the proportional party vote of the deeply unloved Liberal Democratic Party (LDP) and the vote for LDP candidates in the districts -- and I know that exactly the same pattern existed in the House of Representatives election of 2009 when the LDP and the New Komeito were coalition partners engaged in open vote switching, then please, please, please do not tell me that the 5.3 million unaccounted-for, highly disciplined New Komeito voters were free to vote willy-nilly on July 11 -- that they did not in the vast majority of instances submit their district votes to the LDP candidate in their district. The other day I asked two of the sharpest Japan optimists, Naomi Fink and Richard Katz, to give me five sentence-long answers to two simple questions on the actual size of Japan's national debt and the management of its national assets. They both grossly disregarded my instructions as to length, as you will see. I am the wiser, however, for their disobedience. With their permission, I here share their answers to my two questions. Q1: Why is net debt rather than gross debt the more important number to keep in mind regarding Japan's financial position? Q2: What are the main assets aside from Japan Post and shares in JT that the Government of Japan should sell in order to finance its budget deficit, staving off for a while the imposition of a rise in the consumption tax? "The financial burden of the debt equals the net amount that the government as a whole owes to the private sector (and therefore the net amount of interest it has to pay the private sector). But about half of the gross debt in Japan consists of debts that one government agency owes to another, debts that in fact cancel each other out. For example, a substantial portion of the gross debt consists of bonds bought by the Bank of Japan rather than private investors. Another substantial portion of the debt consists of surpluses in the social security account. Suppose the social security system raises 100 billion yen more in year X than it spends. And suppose the rest of the government spends 100 billion yen more than it gathers in taxes. For the government as a whole, the deficit that year is zero. But in Japan, the social security system will "lend" that 100 billion yen to the MOF. The government's gross debt has thereby increased by 100 billion, even though the net debt--and hence its real financial burden--has not increased at all. Selling assets does not solve the problem, except in a very short-term slipshod accounting sense. Let's assume that the assets are worth something, that they earn a return. Otherwise no private buyer would want to buy them. In that case, the government has gained some immediate cash, but it has lost the right to all the revenues that would accrue to it in the future from owning that asset. So, for the sake of quick buck, it has reduced its future non-tax revenue. There are some very good economic reasons to get the government out of the business of selling cancer sticks and running a huge bank and insurance company. But the notion that solves the problem that annual revenue falls short of annual spending is not one of them." Naomi Fink, Japan Strategist, Global Marketing & Trading Division, Bank of Tokyo-Mitsubishi UFJ, Ltd.
"Regarding the first question, it is not more important to keep in mind net than gross debt when looking at the adverse impact of a massive government balance sheet upon growth - that the government carries much intra-governmental debt with little to show for it is not a recommendation for the efficiency of their asset allocation. However, if we are to discuss the probability of a fiscal crisis, canceling out intra-governmental assets and liabilities is relevant first and foremost - as Rick Katz pointed out, the MOF's ability to borrow from the social security system reduces the need for fund-raising from the private sector. But apart from net versus gross debt, it is also important to keep in mind when discussing the probability of financial crisis the country's external surplus/deficit position. Much less of Japan's current account surplus is being "recycled" abroad via direct and portfolio investments and instead is coming back to sit in banks as savings. Then, instead of lending banks are buying... what else but government debt? These "risk free" assets gain a higher capital weighting on banks' balance sheets, plus allow absorption of a greater amount of debt. This is why the G-20 exempted Japan from the necessity to reduce its fiscal deficits. On the second point, I would disagree with Richard that selling assets makes no difference to deficits - in the late 80's when the government privatised NTT , there was not only the $70-80bn gained via the series of offers from privatisation itself (which is a sizable flow over the space of three years) then there was also a rise in both corporate and income taxes - because you can tax a privatised company's profits (assuming that privatisation makes it more efficient and thus profitable) plus the dividends on mostly retail investors' participations in the IPO. Longer-term, the idea is that these flows will jump-start asset reflation, which will be extended by the greater productivity of assets under private-sector than public-sector management. And judging by the experimental reverse privatisation of Yu-pack, such an argument might be made for Japan Post! Apart from Post and JT, one potential target would be the highways (perhaps follow the JR model and privatise plus regulate, to minimise profiteering as the government is wont to do). Then you have several hundred trillion in financial assets, comprised of foreign reserves, stocks (from the Banks Shareholding Purchase Programme), Zaito debt and FILP deposits. Of course, it would not make sense to dump all of this at once, but selective thinning out of the portfolio as assets reflate would make sense - these assets were accumulated under emergency circumstances, after all. I think that was the idea that Fortress had when they proposed setting up a fund that would buy non-performing assets from banks and - yes - governments projecting a 20% return. Yes, they might be wildly optimistic but let's face it, asset valuations are quite low in Japan and there is plenty of room to maximise the productivity of some of the currently government-owned or supported assets instead of using fiscal stimulus to keep zombie firms from going bankrupt. The statutory tax rate on corporate earnings is 40%. The actual average tax:profits ratio for the corporate sector as a whole is closer to 26%. If the government owns NTT, it gets all of the profits. If it sells it and taxes the profits, over the long haul, it gets a fraction of the profits. Unless NTT more than doubles or triples its profitability simply by virtue of not being government-owned, there is net loss in the future revenue stream for the government. Keep in mind there is a big difference between government ownership and government management. Management is JR running too many mostly-empty trains due to government pressure. Government ownership of shares of a firm run like a private one is a very different kettle of fish. No question but that the government should get totally out of certain businesses because that will raise efficiency and potential GDP growth. But the impact of that in Japan is rather marginal given the low share of government-run businesses. Without a genuine program to raise the efficiency of the private sector and deal with chronic shortfalls in domestic private demand, Japan will remain addicted to deficit. One-time only sales of assets won't solve the problem--no more than does a sale of a division by a private firm that still doesn't know how to make money. It only postpones the inevitable. As for the claim that the government selling its shares in JT will instigate asset price inflation, I'm sorry, but I don't get it. I believe Japan Postal Bank and Japan Post Insurance should be abolished, not privatized. Turning one of the world's biggest governmental monopoly banks and insurers into private monopolies doesn't promote efficiency. As for the other financial assets mentioned (foreign reserves, stocks (from the Banks Shareholding Purchase Programme), Zaito debt and FILP deposits) how does transferring ownership of pure paper promote growth if the real assets behind this paper remains problematic? It seems to me that debt is debt, whether owed by the government or the private sector. We've seen lots of private debt crises, e.g. the US subprime. The issue is whether the assets backing that debt create the financial wherewithal to finance the debt service. If the government borrows money to improve infrastructure that, in turn, raises GDP and tax base, the debt is justified and does not become a financial problem. If it created debt to build bridges to nowhere, it does create a problem. If the private sector creates debt and debt-backed securities on buildings that are worth less than what it cost to build them, then it does create nonperforming loans. Just transferring debt backed by bad assets from government hands to private hands does not create financial solvency. Rick, I do agree that increase in efficiency is central to the success of privatisation - if it not possible at once to maximise profits and reduce costs by electing private-sector management, privatisation is, as you say, a mere transfer of assets. More transparent and better-quality management of the assets does matter and one clear purpose of privatisation should be to raise the marginal revenue of the privatised entity. As such, when discussing the merits of offloading the business from the government's balance sheets as a going concern, one must consider both sides of the balance sheet - if the government achieves poor marginal utility from the assets with regard to their pareto efficiency, then the government's costs are also likely to be larger than those which would be imposed upon a more efficient manager of those assets. And I do not take as a foregone conclusion that private-sector management, even if subject to government regulations, will necessarily achieve a negligible change in efficiency of asset allocation. You say, "No question but that the government should get totally out of certain businesses because that will raise efficiency and potential GDP growth." Indeed - and in the final paragraph, you question the ability of private sector Japan to manage entities, once privatised. Certainly, corporate governance is a very valid concern, shared by many overseas investors in Japanese stock. But low levels of current productivity is precisely why many wish to get in here - to achieve the superior returns that accompany increases in marginal revenue. This is where I believe that widening the investor base - particularly opening the doors to a variety of foreign investors - might help. The Fortress example is one such initiative (though time will tell whether successful). While the government is reluctant to "sell out" to foreign investors, there is probably value in exploring a model wherein foreign investors provide valuable information on the efficiency - and thus pricing - of private sector assets, long skewed by indiscriminate government handouts to for-profit firms. As for your caveat that the impact of government getting totally out of certain businesses in Japan, that it is rather marginal given the low share of government-run businesses -- sure, but public financial intermediaries DO control 30% of domestic lending, which has the same effect - if we are to believe Modigliani and Miller, firm valuation is not determined by whether the firm is capitalised by debt or equity. The high rate of government intervention in lending could explain at once the high level of tolerance for poor corporate governance as well as the low level of competition among private sector lenders, who have been increasingly disenfranchised from provision of liquidity. Regarding the link between IPO's and asset reflation - I refer back to NTT and the large proportion of retail investor participation in the offer. Retail investors, large holders of cash, dissave (thus reversing one of the key drivers of asset deflation) and divest deposits into equity assets. Thus, bank deposits do not build and are NOT funneled by banks into JGB holdings (Yucho was the leader of this trend), a trend that continues until investors turn risk averse once again about the ability of their future income flows (investment as well as employment income is important in a country with an aging population). So I take your point - the IPO is no universal salve to poor asset allocation and deflation but is one trigger which, if followed through by greater productivity in assets throughout Japan, could restore a "virtuous circle". On your point about taxes -- "The statutory tax rate on corporate earnings is 40%. The actual average tax:profits ratio for the corporate sector as a whole is closer to 26%" -- I agree that the tax base is too narrow in Japan - according to the OECD, only one-third of corporates pay taxes at all. But this is a questioning of broadening the tax base, which might be done in tandem with a decrease to the headline corporate tax rate. If a greater number of firms pay taxes of 30% rather than 26% or zero (the remaining two-thirds) then presumably this should minimise the impact of cutting taxes on the handful of large corporates who actually pay 40%. You say, "I believe Japan Postal Bank and Japan Post Insurance should be abolished, not privatized. Turning one of the world's biggest governmental monopoly banks and insurers into private monopolies doesn't promote efficiency." Perhaps - but the question is whether the government will realistically abolish both - and they probably will not. Thus minimising these entities' inefficiencies is probably a good compromise. There is an alternative to establishing private-sector monopolies and here "privatise and regulate" can work both ways - instead of "running half-empty trains," forcing JP Bank/JP Insurance to adhere to private-sector regulations on disclosure, record-keeping and capitalisation, plus pay private sector taxes could have a positive effect on private sector competitiveness. Using recent examples either actually implemented or proposed, exempting intra-Japan Post transactions from consumption tax puts private sector institutions at a cost disadvantage - as does the universal guarantee on bank deposits, as does the exemption from Basel II (let alone imminent Basel III) capitalization, as does the idea that know-your-counterparty rules should not apply uniformly to JP Bank as to private sector banking institutions. And the argument that imposing these guidelines will merely add to JP Bank's cost base makes the controversial assumption that the benefits of these private-sector guidelines are not valuable contributors to risk-weighted profitability - which if valid must be taken up with the BIS and anti-money laundering task force immediately! Add to this greater disclosure requirements to answer to private-sector shareholders.... greater transparency is central to identifying a firm's operating inefficiencies - such that if JP Bank/JP Insurance truly prove, under private sector standards unable to efficiently deploy their assets, the case for breaking up these large state-controlled "monopolies" emerges much more clearly than it would under limited-disclosure government ownership. I think we do agree that the quality of asset allocation matters more than the transfer itself of assets from the public to private sector. For example, the idea of privatising half of Japan Post under the Kamei plan most likely would have been, as you say, little more than a transfer of assets veiling a privately-funded expansion of government-controlled monopoly, and it is probably quite helpful in this regard that the USTR and European Trade Commission decided to push for a "level playing field" in postal privatisation. Michael, I think we are done and have given your readers something to think about. Thank you both very much for this - it has been a good, thought-provoking discussion. Four years ago, in a weak moment, I wrote a tongue-firmly-planted-in-cheek set of "rules for understanding news from Japan" for my amusement and I hoped the amusement of others. Since the time of their composition, some of the rules have become rather dated. On the whole, however, they have held up rather well. If a Democratic Party member claims something is true on television, it is probably not true. When it is true, it was political suicide for him to have said it. So two cheers for Prime Minister Kan Naoto and his egregious introduction of the concept of a rise in the consumption tax based on a misreading of Japan as ressembling Greece and the charged atmospheres inside the Ministry of Finance and at the G20 summit. By introducing discussion of a hike in taxes three weeks before a national election, he has given himself and the Democratic Party of Japan a just-so story for why the party finished with so many fewer seats than expected in the House of Councillors on July 11. Just run the counter-factual: imagine the chaos inside the party right now if Kan had not talked about the consumption tax and they had suffered the same dispiriting defeat. To the benefit of the Prime Minister and the party, they have now a "lesson" that they have "learned" -- and will no longer appear irresponsible if they shelve all ideas about a hike in the consumption tax until after mid-2013. "Whew," the party members can now say, "We are off the hook on that horrible, unpopular, regressive, contractionary, deflationary pseudo-solution to Japan's fiscal and economic growth problems which the bureaucrats of the Ministry of Finance and their acolytes throw out like a spanner into the works of any reasonable discussion of Japan's economic future!" Rather than going through the trauma of breaking up the Cabinet after Minister of Justice Chiba Keiko's failure to win reelection to her Kanagawa seat, she will continue her service as minister as a civilian, at least until the September elections for the leadership of the Democrati Party of Japan. So not gone, not forgotten is the minister of The Law. 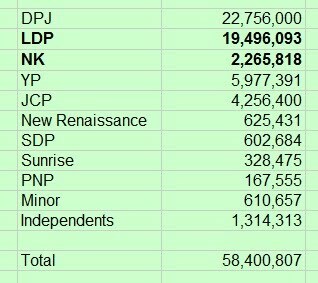 In 2004, the DPJ won 21,137,458 of 55,931,787 votes. In 2007, it won 23,256,242 of 58,913,679 votes. Just over 18 million this time around. 1) Ho-Ho-Ho - After belittling the Sunrise Party of Hiranuma Takeo last night, saying that his party will not win a seat, late calculations have proven me wrong. The Sunrise Party (Tachiagare Nippon) won the hearts of 1.3 million voters, which is just enough (2.2%) of the vote to win one seat. The New Renassance Party also managed to eke out 1.3 million votes and thus a seat. Unfortunately, the party had five of its members up for reelection. 2) Turnout - was a respectable 57.98% of the electorate. Nothing spectacular but not too shabby, given recent trends. 1) Turnout - The earlier stories about abysmally low turnout seem to have been mistaken. Other reports are coming in of turnout of slightly over 57%-- which would mean just over 59 million votes. So turnout seemingly was not a cause of the wipeout. 2) Koizumism is Back - Not only was Koizumi Shinjiro's fervent campaigning cited by every commercial television network as having bolstered the spirits, if not exactly the results of several of the LDP's candidates, his father's female "assassins" managed to fight their way back into the Diet. Katayama Satsuki and Sato Yukari both won seats off the LDP proportional list, while Inokuchi Kuniko captured one of the three Chiba district seats. The DPJ's strategy of running against the legacy of the most popular Prime Minister of recent times will probably have to be rethought. 3) Not Stupid - Former DPJ party leader Ozawa Ichiro was severely critized by members of his own party for assigning a second DPJ candidate to two seat districts where the traditional split was one seat going to the LDP and one to the DPJ. His was a gutsy attempt to capitalize on the vote burning of 2007, when running a single DPJ candidates in two seat districts left hundreds of thousands of votes lying on the table as the DPJ candidates overwhelmed their LDP opponents. Running two DPJ candidates in two-seat districts did not pay off: nowhere did the DPJ win both seats being contested. However, neither did it seem to have hurt the DPJ eithet; it has seemingly won at least one of the two seats in all of the 12 two-seat districts. The only place where the DPJ was running two candidates only to suffer an unexpected loss was in Kanagawa Prefecture, where the lackluster Minister of Justic Chiba Keiko has lost her seat, finishing fourth behind the LDP, Your Party and other DPJ candidate. Given Chiba's almost invisible performance as minister of justice since her inauguration, she will not be much missed. Her seat sure as heck will be, though. 4) Ren Ho, Superstar - Notwithstanding complaints from dinosaurs like Hiranuma Takeo -- whose Sunrise Party will win not a single seat -- that she is not "originally Japanese" Ren Ho (or Renho) is undoubtably the face of the DPJ. She demolished her opponents in the Tokyo district race, finishing over 500,000 900,000 votes ahead of her nearest rival in the most lopsided contest ever. She has been on all the network broadcasts this night, keeping a stiff upper lip and defending the Prime Minister in the face of clearly less-than-stellar returns. 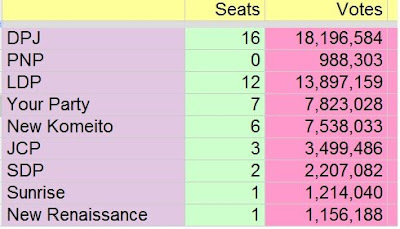 My predictions for 58 seats to the DPJ is getting hammered. 1) Turnout seems to have been abysmal. The number that just flashed upon the screen was 43.25% of the eligible electorate voting. When turnout is that low, a huge number of voters are confused as to how their votes will matter -- and they stay home. The DPJ lives and dies on convincing the non-aligned voters to turn out. In the total destruction of meaning in this election, a huge number of the non-aligned seem to have decided to sit this one out. 2) Though it is still unclear, the indications are that activities of local chapters of the New Komeito have condemned the party to the policy wilderness. If, as the press has reported, many of the local chapters have told their voters to support the LDP candidate in the single-seat and double seat districts, then the party has guaranteed the DPJ will never choose the New Komeito as a coalition partner. The historical significance of this decision cannot be overemphasized. Since 1993, the Komeito and its sucessors have always sought to ally with the party either in power or capable of winning an election, as it did as a part of Ozawa Ichiro's conservative-conservative New Frontier Party in the 1995 House of Councillors election. The party has not at any time in the last 27 years ever strayed from a drive for power. Even though the NFP lost only 4 seats in the 1996 House of Representatives election, and was still a huge force in the House with 156 seats, the Komeito halted the full absorpton of itself into the party after Tsutomu Hata and his followers left to form the Sun Party (Taiyo no To). It is unclear what the New Komeito thinks it is doing, having put itself into a position where the DPJ has reason to hate it ever more than it hates its main rival the LDP. There is just no accounting for political auto-ostracism. In the spirit of the rule of the day, which is that all campaigning is done and finished on Election Day, a slide show of placid images from a Golden Week visit to Chichibu, in Saitama Prefecture. The author of Twisted Flowers has laid down his marker: the Democratic Party of Japan will top out at 52 seats tomorrow, far from the 60 it needs for independent control of the House of Councillors. It is indeed almost certain the DPJ will fail to achieve its goal of 60 seats. However, the party should get within striking distance, doing far better in the district elections than projected. Voters on some of the outer islands have already dropped their ballots into the ballot boxes (they vote early so that bad weather will not prevent the delivery of their sealed ballot boxes to the counting centers) and over 15% of the likely final turnout has already delivered its verdict through early voting at the ward and local municipality offices. It has been a long road to Election Day...and the game is afoot. The wild card is voter turnout. If turnout exceeds 58,000,000, rabbits will be pulled out of hats. For a review of what this House of Councillors election was supposed to mean, please see my op-ed published at The Diplomat. One of the results of the drastic review process of the Government Revitalization Unit (GRU) this year and last was a 20% reduction in the budget allocation used to promote voting and increase voter participation rates, which are currently stuck at around 54%-to-58% of the electorate. As a consequence, local authorities are looking for innovative ways to promote voting at at dramatically lower costs than before. The movement even has its own name, the "cheap-cheap strategy" (kechi kechi sakusen). In some areas, local authorities are pairing up with retailers, promoting the election with stickers on food packages, or posters on the front doors reminding customers that Sunday, July 11 is the day of the vote for the House of Councillors. It was thus with tremendous interest that I today received, together with my groceries at Peacock -- the supermarket division of the Daimaru retailing empire -- a flyer with a most intriguing offer printed on its lower extremity. 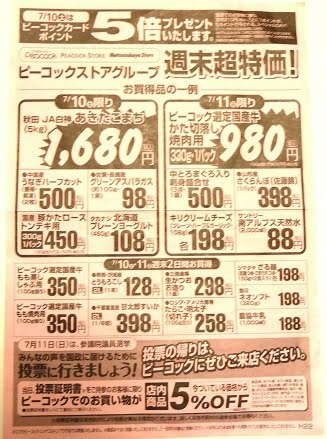 Here is an image of the flyer in its entirety, most of which is covered with announcements of special prices on a variety of goods going on sale on July 10 or July 11. Here below, however, is the image of the lower extremity of the flyer, whereupon is printed the invitation, in diagonal white writing, "On your way back home from voting, please by all means come to Peacock!" According to the offer -- and it is an offer -- if you present proof of having voted, you will receive a 5% discount on your final total* at the register. I cannot for the life of me understand how this offer, which gives an actual financial reward for a person's having voted, manages to skirt Japan's Byzantine voting laws. Yet is somehow must, or at least will be assumed to do so until we see the prosecutors on Monday marching, cardboard boxes in hand, into Daimaru's headquarters. * Certain products are not included in this offer, including cigarettes, salt, digital photo printing, gift coupons and dry cleaning. 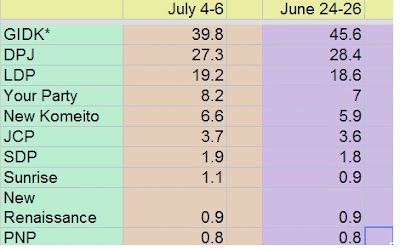 Funny thing about the Kyodo polling reports whose numbers I posted yesterday. If you actually add up the numbers in the article, the various shares of the vote add up to 109.5%. Someone somewhere is unclear on the concept of "share of the total vote" -- and it is probably me. Now if the percentage of the electorate that is undecided is 30.3% -- then the numbers add up. (Yes, I know the other column is wrong too). Later - The Lawyer guesses that the figure is an epic typographical error on Kyodo's part, that the number of undecided voters is not 39.8% but 29.8%. The Lawyer is almost certainly correct. House of Councillors Election 2010 - Panic Time? The latest figures from Kyodo on which parties the voters will be casting their ballots for in the proportional half of the vote on Sunday. * = "Gosh, I Don't Know"
Where is the collapse over the last 10 days? Where is the dramatic shift away from the DPJ? Where is the calamity? Where is the surge for Your Party? On the other hand, I also do not know whether either the SDP or Sunrise or neither of them will manage to clear the 2.2% a party needs to claim a seat -- which can be seen as good news for the DPJ, for it is next in line to get a seat should either of the micro-parties fail to meet the threshold. Your words but a whisper...your deafness a shout! When we left off 10 days ago, the DPJ was in a position in the proportional vote to at least repeat its performance of 2004, where it won 19 seats with 37.7% of the vote. Due to the proliferation of parties bursting out of the LDP these last few years, the DPJ will need only 35.7% of the final vote to match its 2004. Number of seats from the simulation of the D'Hondt system apportionment. With 19 seats from the proportional list, the DPJ is a third of the way from its ultimate goal of 60 seats, which together with the 61 seats it holds from the 2007 electoral cycle, would give the party 50% of the seats and thus control of the House of Councillors. With control of the House of Councillors with the 307 out of 480 seats the party holds in the House of Representatives, the DPJ would be in the position to pass unencumbered most any piece of legislation it might desire. It would be able to do so for three years as the next House of Representatives election need not be held until mid-2013, when the House of Councillors has its next election. The DPJ certainly wishes to secure these two advantages. In order to do so, DPJ candidates have to win 41 of the 73 district seats up for election. The newspapers are laying down bets that the DPJ cannot possibly succeed in this endeavor. 1) Ozawa Ichiro's three years of wandering the hinterlands cultivating local primary industry, small business, professional group and religious order votes the DPJ had theretofore ignored. 2) the lack of a clear reason to vote for a specific LDP district candidate other than to prevent the DPJ from having a majority in the House of Councillors. 3)the end of official cooperation between the New Komeito and the LDP. 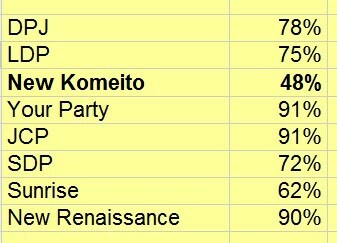 The end of the LDP-New Komeito coalition throws a monkey wrench into almost any calculation of potential results of this elections. Here's how. The New Komeito has 8 million dedicated voters who will turn out on July 11, typhoon or shine. In the proportional half of the vote they will vote for the party or for particular members of the party. However, except in Saitama, Tokyo and Osaka, New Komeito voters have no one to vote for in the district elections. This is because the party, mentally fried by the 2009 House of Representatives election where every single one of its district candidates lost his or her seat, has put up a district candidate only in those three prefectures. It has no official candidates anywhere else. Now a great fraction of New Komeito's total 8 million (about 13% of the likely final total national vote) live in just those three prefectures. Tokyo hosts about 825,000 New Komeito voters; Osaka about 790,000 and Saitama about 580,000. New Komeito voters are also extremely numerous in Kanagawa (690,000) and Aichi (580,000) Prefectures, but are not so numerous to able to elect candidates in these districts on their own. Subtracting these huge numbers of Komeito voters living in these core city prefectures from the 8 million total, one is left with some 4.5 million votes, scattered around the remaining 42 prefectures in varying densities. That's a lot of votes, and in prefectures where the margin of victory is 30,000 votes or less, the lack of New Komeito support could be fatal for the hopes of an LDP candidate. 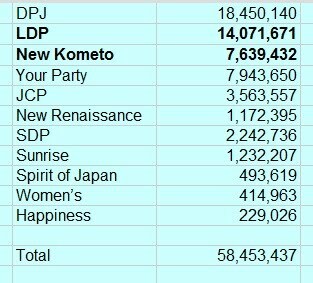 The importance of New Komeito voters for the LDP was established in 2009. Except in the districts where the New Komeito was running its own candidates, the 8 million received divine guidance to vote for the LDP, and 7 million of them seem to have responded - providing the LDP with about a quarter of the votes in received in the district elections. There is nothing wrong with this kind of vote swapping -- except that it turned out to have been pointless. In the 2009 House of Representatives election, even with the 7 million New Komeito voters voting for the LDP's district candidates, the LDP got slaughtered. This time around New Komeito voters have been no clear, public instructions from on high as to whom they should vote for, other than the New Komeito candidates in the three districts listed above. The print media is saying that local prefectural branches of the New Komeito are leaning toward supporting the local LDP candidate. The general theory being espoused is that by cooperating with the LDP again, the New Komeito will prevent the DPJ from winning enough seats to have a simple majority. Indeed, with the present sour mood toward the DPJ and the support of the New Komeito, the LDP and Your Party (Minna no To) could even steal seats from the DPJ's present totals. With its seat totals far below what it needs to move legislation through the Diet smoothly*, the DPJ will have to go on a search for coalition partners. Your Party's Watanabe Yoshimi has stated his party will not form a coalition with DPJ. Which would leave the New Komeito as the bridesmaid of choice for the DPJ. Do you see the problem with this theory, why is is dafter than Daft Punk? It is step #8 that I am having trouble with right now. It is beyond my capacity to imagine that the DPJ, its hopes and dreams having been thwarted by an LDP aided by the New Komeito, will turn around and ask the New Komeito to be its partner. So no matter what the evening sports newspapers are saying, the New Komeito cannot be reviving cooperation with the LDP -- not if it wants to be part of a post-election order...and if the LDP is going to try to defend its 25 current districts without the support of the New Komeito machine, it will fail. So what are my predictions for the results for this election? Worst case scenario - The DPJ defends the 36 district seats it now holds. 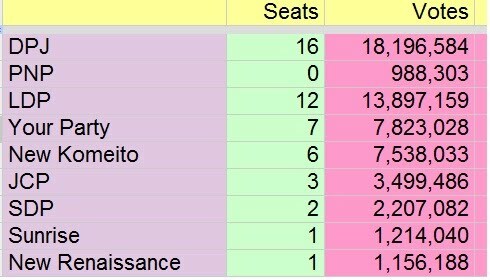 Together with the 19 seats it will win the proportion vote, it will be at 5 seats short of the magical 60 it needs for a control of the House. It will gain that control through absorption of independents and breakaway members of other parties -- or by making Watanabe Yoshimi an offer he cannot refuse (Financial Services Minister?). Best case scenario - the DPJ wins 60-to-62 seats -- 19-to-20 in the proportional and 41-to-43 in the districts. Going at this backwards, the ultimate maximum for the DPJ in the districts is 61 out of the total 73 seats - the total number of district candidates the DPJ is running. The party has no candidate in angry Okinawa -- where the terms "DPJ candidate" and "snowball's chance in hell" would probably go very well together. The party is otherwise offering a candidate every other in the single-seat districts except Kagawa, where it, the Social Democratic Party and People's New Party are supporting an independent. In its most audacious bet, the DPJ is running two candidates in all but 2 of the 12 two-seat districts: everywhere but Fukuoka and Niigata. In Fukuoka, the New Komeito branch seems to be cooperating openly with the LDP candidate, making his election a given. The DPJ seems to have conceded there was no point in fielding a second candidate. In Niigata, the DPJ's main opponent and likely top vote getter is a member of the former coalition partner SDP. The DPJ is fielding two candidates in the three-seat districts of Chiba, Kanagawa, Saitama, Aichi, though only a single candidate in Osaka. In Tokyo, it is has two candidates vying for the five seats available. So in its drive to secure control of the House of Councillors, the DPJ has to win two thirds of the seats it is contesting. Or, looking at the same problem from the opposite direction, the DPJ can withstand up 20 errors in electoral strategy and still come out on top. Against an opposition whose top member's claim to fame is that under its rule, the country was run into the ditch it finds itself in. I think the voters will by July 11 figure out where their interests lie. I have faith in their numbers. * "Smooth Diet relations" being an inexplicable fetish of media correspondents and commentators. Indi, Just Let It Go! 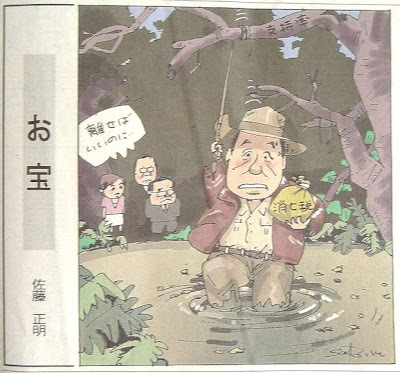 Why I love Sato Masaaki, the cartoonist at the Tokyo Shinbun. The title of this work is "The Treasure" (Otakara). Dedicated to EC, Richard Katz and Gerald Curtis. * Just why Tanigaki would feel anything but unbridled joy at Kan's hanging on to a pledge to serious consider raising the consumption tax as a part of his fiscal reconfiguration package escapes me. Maybe the tall man in the glasses is supposed to be Ozawa Ichiro. Okumura Jun is back with two excellent overviews of the current state of the race and some cracking analysis about the potential fallout of this election. - Will the DPJ Win a Simple Majority in the Upper House? As for me, some political perspective...a propos of potential outbreaks of hyperventilation in the press. In the Mediterranean and in Mitteleuropa, when a government proposes stringent fiscal measures, this in a desperate effort to combat exploding debt and deficits, the people respond with general strikes and marches with flags and banners whilst masked radicals toss cobbles, injure police officers and destroy public and private property. In Japan, in the face of similar threats from the government, the Cabinet's popularity rating declines 10% whilst the percentage of persons saying they will be voting for the ruling party in Sunday's House of Councillors proportional vote plunges by 2%. Oh tell me, where one may find the homeland of sweet reason and civilization? Posted over at Twisting Flowers is a depressing review of the latest polling data. According to the author's analysis, the gamble of calling the Liberal Democratic Party's bluff on raising the consumption tax to 10% has backfired upon the Democratic Party of Japan, eroding confidence in the Cabinet and reducing the percentage of persons responding favorably when asked about the DPJ. However, looking at the numbers in the bottom row of the Twisting Flowers charts seems to indicate that it is not yet the hour to be hitting the panic button. The number of undecided voters is still one third of the electorate, a few of whom fled support from supporting the DPJ in the general hysteria being generated in the media over the prospects of a consumption tax increase. Even then, the shift is only of a few percentage points, and not toward any of the opposition parties. As for the drops in Cabinet ratings -- well, why not? The Diet is in recess; the Cabinet members are all out on the campaign trail-- all, that is, except for the PM himself, who had the annoying responsibility of representing his country at the G8 / G20 summit and sing along with the Hallelujah chorus there of fiscal stringency. Why wouldn't they fall, when it is unclear that the Cabinet is, in fact, doing anything? Now that The Man is back on Japanese soil, the solution for the DPJ is simple: let the big dog run. Prime Minister Kan Naoto may not have the greatest of lilting cadences but he is damn clear and straight about what he says. He is the new DPJ brand -- the party can do little else but let him roll up and down the length of this land dispensing his serious but self-deprecatory common sense. The question is not the amount of time left before the election; it is how many hours a day the party can keep the PM talking (he will need a voice coach). The more people hear him, the more they like his party and its ideas. The PM had to leave Japan at an inconvenient time. It is imperative that in the week that remains that he be out on the streets and in the studios of his homeland, making the case for his government. Then we will see what the polls say. In politics, what you see is not always what you get. Tokyo is blessed because it sends five Senators (yes, that is what they are called) to the House of Councillors. Tokyo is cursed because it has to select five Senators for the House of Councillors. First there is the list itself, with a staggering 24 names. 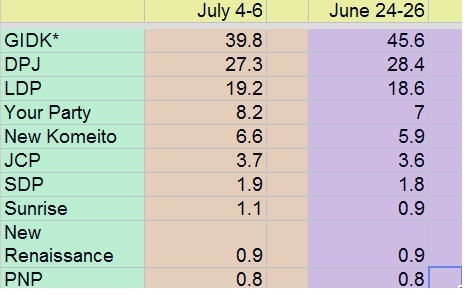 Only Aomori and Kumamoto, each with 5 candidates vying for but a single seat, have more freewheeling level of competition, and then only fractionally. In Tokyo, recent candidate inflation rate is just out of control: in 2007, there were 20 candidates for the 5 seats, in 2004, there were 11 candidates for 4 seats. And why not? House of Councillors member is a great job. A six-year position with a fabulous salary, extraordinary housing and transportation perquisites, basically three free meals a day, personal and family security, social status and very few responsibilities. It is a wonder that there are not hundreds of aspirants. Then there is the plethora of parties, mostly of the right. In 2007, voters had to contend with 6 parties offering candidates and a mass of independents. 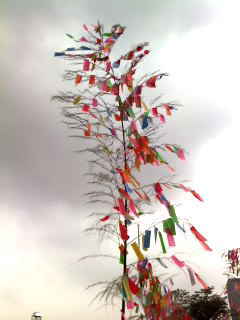 This year there are 9 parties, if one includes the Nippon Soshinto and the Happiness Realization Party, plus a lot of candidates from what claim to be parties. Then there is the doubling up. The Democrats have two incumbents, Government Revitalization Minister Renho and the Democratic Party of Japan's top vote getter in 2004 Ogawa Toshio. They are being challenged by a pair of two LDP candidates: incumbent Nakagawa Masaharu and newcomer Tokai Yukiko, holder of a U.S. journalism degree. Then there are the guys with the movie star good looks and the scintillating resumes. First is the attractive and savvy Matsuda Kota, the man who brough Tully's Coffee to Japan. He is running on the corporate-sponsored Your Party (Minna no To) ticket (odd that). He is matched on the left by the Social Democratic Party's 37 year-old Morihara Hideki, a former international NGO worker. Once past these six candidates, one crosses a over to the wrong side of the tracks, where one's associates cast a shadow upon one's image. The candidate on Easy Street is Takeya Toshiko of the New Komeito (and yes, that fade in is creepy). Even though Takeya's party has been for the last decade the LDP's coalition partner in government, selling out nearly every one of its core principles in order to hold onto a ministry, the New Komeito still has enough cadres dedicated voters in Tokyo to get Takeya elected no matter what. She has 790,000 to 800,000 votes in the bag, and in the 2004 and 2007 elections, the highest ranking failed candidates won 597,000 and 652,000 votes, respectively. The hard-luck case is Koike Akira, who is himself not bats--t crazy but as a member of the Communist Party will be treated as such. One of the rare physicians in the Diet and blessed with a good sense of humor, he will be anathema to all but his party's faithful. He would have a decent shot at winning a seat as an independent, especially if he made a special effort to label himself an ex-Communist-running-as-an-independent. Instead, he should go down ignominious defeat with a 450,000 JCP loyalist votes. After this, one crosses the Rubicon, from the acceptable to the bats--t crazy. Back in the old days, when comedian/actors like Aoshima Yukio or prominent writers, architects, doctors or whatnot were on tail end of the ballot, one could toss a vote in their direction, certain one was at least giving the country a reason to smile, or, as it turned out in Aoshima's case, would have capped off a great double career. What to do? What to say? It is right-wing fringe you like? Come on it -- so many different flavors one available could start up an ice cream store. Possibly sane independent one has never heard of before? The voters have at least nine to choose from. c) filled with a hatred so intense for Ogawa Toshio he registered himself just to mess up Ogawa's otherwise fairly certain reelection. So how to winnow out 5 winners from out of this mass? My guess is that Renho is the top vote getter and Takeya Toshiko wins a seat on the Soka Gakkai vote. Ogawa Toshio survives but in only fourth or fifth place due to his obscurity relative his glamorous fellow party member and the other Ogawa's meddlesome presence. Nakagawa Masaharu was the top vote getter of all in 2004 but he will be fighting with his colleague Tokai Yukiko. He will grab the fifth seat, if an LDP candidate finishes in the running at all, the poor showing due to the collapse of the LDP's Tokyo party organization and the plethora of right wing fringe candidates on the ballot from tiny but still established parties. Of the pretty boys in the running, I am guessing Matsuda wins the last seat on both the media-zaikai tailwinds currently inflating the reputation of Your Party and his Matsuda's actual reputation for bringing in a business into Japan and making it a success. With thanks to John de Hoog for his help. Later - This post has been edited for clarity. "Brilliant!" he said. [cut] "Totally mad," he said, "utter nonsense. But we'll do it because it's brilliant nonsense." Pity the poor DPJ-supporting, DPJ-leaning or even DPJ-sympathetic voter of Tokyo. In the upcoming House of Councillors election she will have to choose 5 individuals from out of a list of 24 candidates. The first two are easy: the DPJ incumbents Ogawa Toshio and Minister for Government Revitalization Renho. After filling up her DPJ card (the DPJ having made what looks like an error in running only two candidates in a five-way race) the voters still has three more votes to apportion -- and no means of doing so without feeling ill.
For the sake of voting for known moderate conservatives, she could vote for one of the two LDP candidates: incumbent Nakagawa Masaharu or newcomer Tokai Yukiko, a former GE employee and holder of a U.S. journalism degree whose heavily photoshopped campaign posters unfortunately recall the Katayama Satsuki disaster (Katayama, the former Mrs. Masuzoe Yo'ichi for those who are new to this game, is one of the candidates on the Liberal Democratic Party's proportional lists). The actual Ms. Tokai is somewhat (mercifully?) less doe-like in appearance. However, voting for the candidates of the main opposition party would negate the DPJ voters' main hope, which is to deny the opposition the number of seats it would need to stop the DPJ from controlling the House of Councillors (which is 61 seats, assuming no fiddling with quorums during the Diet sessions). So Nakagawa and Tokai are out. Out also is, by dint of association, the attractive and savvy Matsuda Kota, the man who brough Tully's Coffee to Japan. While he would be a shoo-in as an independent, he is unfortunately running on the Your Party (Minna no To) ticket, the DPJ's deadly rival among the urban permanent employee and managerial class vote. A vote for him is as much a vote against the DPJ as a vote for an LDP candidate. The party that may benefit from confused DPJ voters searching for a way to spend three votes is ironically the Social Democratic Party, the party's whose march out of the coalition precipitated the final collapse of the Hatoyama government. In terms of policy, the choice is insane: the SDP vehemently opposes the current government's acquiescence to the Futenma-to-Henoko shift and the raising of the consumption tax. However, as compared to the other parties and the independents on the ballot, the SDP's got the right attitude: skeptical of the bureaucracy, for consumer rights and for more ecologically and socially gentle government policies. It does not hurt that the SDP's candidate is a handsome former international NGO worker. Which leaves 18 candidates on which to spend the remaining 2 votes. Back in the old days, when comedian/actors like Aoshima Yukio or prominent writers, architects, doctors or whatnot were on the ballot, one could toss a vote in their direction certain one was at least give the country a reason to smile, or, as it turned out in Aoshima's case, doing the country a great favor. However, the remaining candidates on the Tokyo ballot, both party-affiliated and non-party share candidates, seem to share a common flaw: they apparently are all bats--t crazy. In a metropolis of 13 million residents, two sane individuals could not find the time, either of their own volition or through the encouragement of friends, to file papers to run for a six-year position with a fabulous salary, extraordinary housing and transportation perquisites, basically three free meals a day, personal and family security, social status and very few responsibilities. Not even as a lark. To be fair, Koike Akira is not bats--t crazy. But as the candidate of the Japan Communist Party, he is anathema to all but his party's faithful. Like Matsuda, he would likely win a seat as an independent, especially if he made a special effort to label himself an ex-Communist-running-as-an-independent. Instead, he should go down ignominious defeat with a mere 500,000 votes. Except...when you have 30%-35% of the voters searching for a sane, non-LDP, non-Your Party alternative, being a JCP candidate may not as much of a handicap to election as it should be. Now the voter has one vote left. What to do? Right-wing fringe--of which there are so many different flavors one could start up an ice cream store? Unidentified possibly sane independent one has never heard of? Irony of ironies, the safest place for a DPJ voter to park her last vote? Takeya Toshiko of the New Komeito (and yes, that fade in is creepy). Even though Takeya's party has been lambasting the DPJ and its policies; is supported mostly by followers of the Soka Gakkai; and was for the last decade the LDP's coalition partner in government, a vote for her will at least fulfill the Hippocratic Oath: cause no harm. The New Komeito has enough votes in Tokyo to get Takeya elected no matter what. One extra vote for her or a million will not make the least bit of difference for her election chances. It will deny a vote from someone else who might otherwise have a chance. And that is the sad commentary of the state of politics in Tokyo -- that a supporter of the current government has five votes, more than the citizens of any other prefecture (Hurrah!) and not five persons to spend them on. Later - Twisting Flowers has a less idiosyncratic and actually correct review of the Tokyo race and the races in the triple-seat districts.